Click on the bars below to all the subdivisions and condo & townhome complexes in Evergreen. You can also view the most popular searches such as ranch style homes, new construction, homes with a pool or houses with mountain views. Click to see Local Subdivision and Complex Maps. Evergreen is the gem of the foothills towns located west of Denver just south of I-70 bordering Conifer and Morrison to the south. A town full of rich culture and community spirit that offers homes options from gated luxury, golf club communities, equine friendly properties, mountain getaways, townhome and condominium complexes. Homes in Evergreen CO have sought after gated communities like The Timbers and Singing River Estates with custom homes showcasing million dollar views. There are plenty of Evergreen homes for sale in golf communities with The Island at Hiwan and The Ridge at Hiwan. Many townhome and condo complexes like El Rancho where modern meets the mountains. Several neighborhoods welcome our equine friends, Hangen Ranch and peaceful Kerr Gulch/Kerr Gulch Highlands with barns, stables and outdoor arenas plus coveted open space. Looking for Evergreen Real Estate such as an affordable cabin, weekend getaway or a first time home buyer can be found in Wah Keeney Park and Wonderview Park. Check out Hiwan Golf Club , Evergreen Golf Course and Red Rocks Country Club for great courses in the area. Evergreen Colorado Real Estate is encompassed by thousands of acres of mountain parks with miles of trails and outdoor activities. Elk Meadow Park, Alderfer/Three Sisters Park and Evergreen Lake House for trails, dogpaths, water sports and summer concerts. Welcoming culture and community oriented year round events with local artist, theater, specialty shops, Farmers Market, music and dining in the Heart of Evergreen at the Historic Downtown area. You will find many winter activities in the area like ice fishing, ice skating, snowshoeing and cross country skiing. Many families are drawn to purchase a home in the Evergreen Colorado Real Estate market for its top rated schools. Evergreen has easy access to the ski slopes, Conifer, Morrison, Golden, the Tech Center and downtown Denver from I-70, C-470 and Highway 285. 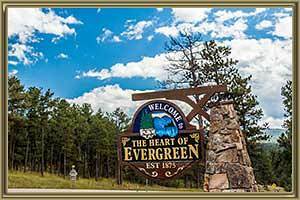 There is so much to offer in Evergreen with all the city amenities while breathing fresh mountain air. Our Evergreen Real Estate agent can show you all this wonderful community has to offer. We can show you the details on active homes in Evergreen CO, subdivisions, an interactive community map and things to do. Whether buying or selling, you can learn more about the current Evergreen Real Estate Market Trends, get a Free Personalized Market Report. You will see how the market is trending, find out what sold recently and for how much, see all Evergreen homes for sale and much more. Call us at 303-325-5690 to talk to our Evergreen Real Estate Agent for your need of homes for sale in the Evergreen community. See all the Things to do in Evergreen, CO. Thinking about selling your home? Get your Evergreen Home Value Instantly Online. Speak with local agents about Evergreen CO Home Values. We will provide a detailed home value, pre-listing advice and offer a free staging consultation for all listings. Use our advanced online search tools to see the sold and under contract homes in your area. Check our Evergreen local market trend reports below. Our market updates show the area appreciation, the average sold prices, the percentage of sold price to list price, average days on market and much more. We specialize in local real estate including Evergreen and homes for sale in all of the Foothills. We offer Evergreen MLS listings directly on our site as well as all of the Denver Metro listings. View the most up-to-date information from the MLS on our user friendly site. Our Evergreen CO real estate agent can help educate and guide you in picking the best area for your family. To schedule your tour of For Sale Home in Evergreen CO or to request a full market analysis if you plan to sell your home, call Gold Compass Real Estate at 303-325-5690.